In a recent briefing on the LG G7 ThinQ, a company spokesperson suggested its V-series devices will be the first place the company tries rollable or bendable displays. The V-series, which in many ways is the evolution of the 2013 LG G Flex — a device meant to showcase LG’s ‘unbreakable’ curved and flexible display — would indeed seem to be a natural fit. As Lee explained, the V-series is a testing ground for many flagship features. “The idea is that the V’s going to be the one that sort of pushes [things] and is a bit conceptual… and then we make it available on the G, because things become commoditized and become more cost-effective for the broader audience, so that’s the general approach right now,” said Lee. Bendable and rollable smartphones have long been hyped by smartphone manufacturers, with Samsung suggesting its upcoming foldable smartphone will make an appearance sometime in 2019. An LG patent published in January 2018 reveals a few of LG’s foldable display concepts. The device sketches (one of which is shown above) look much like ZTE’s recently-released Axon M, except that rather than featuring two different displays, the display folds in two. 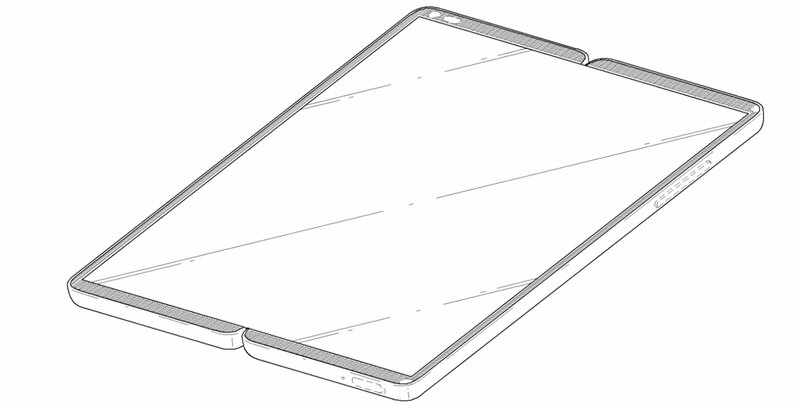 Apple also filed a patent for a device with a foldable display and body in November 2017. Rumours further suggest LG might be Apple’s display partner in the undertaking.